“Fool’s Gold” is technically known as pyrite or iron sulfide (FeS2) and is one of the most common sulfide minerals. Sulfide minerals are a group of inorganic compounds containing sulfur and one or more elements. Minerals are defined by their chemistry and crystalline structure. Minerals that have the same chemical composition but different crystal structures are called polymorphs. Pyrite and marcasite, for example, are polymorphs because they are both iron sulfide, but each has a distinct structure. Minerals can also have the same crystalline structure but different elemental compositions, but it’s the crystal structure that determines the mineral’s physical characteristics. Pyrite is called “Fool’s Gold” because it resembles gold to the untrained eye. While pyrite has a brass-yellow color and metallic luster similar to gold, pyrite is brittle and will break rather than bend as gold does. Gold leaves a yellow streak, while pyrite’s streak is brownish black. If you want to know more about how to tell real gold from “Fool’s Gold,” watch this video produced by the University of Knottingham. Pyrite is so named from the Greek word for fire (pyr) because it can create sparks for starting a fire when struck against metal or stone. This property made it useful for firearms at one time but this application is now obsolete. Pyrite was once a source of sulfur and sulfuric acid, but today most sulfur is obtained as a byproduct of natural gas and crude oil processing. Today pyrite is sometimes sold as a novelty item or costume jewelry. But pyrite isn’t entirely useless; in fact it’s a good way to find real gold because the two form together under similar conditions. Gold can even occur as inclusions inside pyrite, sometimes in mineable quantities depending on how effectively the gold can be recovered. Pyrite has long been investigated for its semiconductor properties. Learn about studies underway to develop pyrite as a material to make solar cells. Pyrite is found in a wide variety of geological settings, from igneous, sedimentary and metamorphic rock to hydrothermal mineral deposits, as well as in coal beds and as a replacement mineral in fossils. Pyrite can be either disseminated throughout igneous rock or concentrated in layers, depending on depositional mechanism and environment. Pyrite forms in sedimentary rocks in oxygen-poor environments in the presence of iron and sulfur. These are usually organic environments, such as coal and black shale, where decaying organic material consumes oxygen and releases sulfur. Pyrite often replaces plant debris and shells to create pyrite fossils or flattened discs called pyrite dollars. In calcite and quartz veins, pyrite oxidizes to iron oxides or hydroxides such as limonite, an indicator that there is pyrite in the underlying rock. Such oxidized zones are called “gossan,” which appears as rusty zones at the surface. Gossans can be a good drilling targets for gold and other precious or base metals. Pyrite is unstable and oxidizes easily, which is an issue in controlling acid mine drainage. 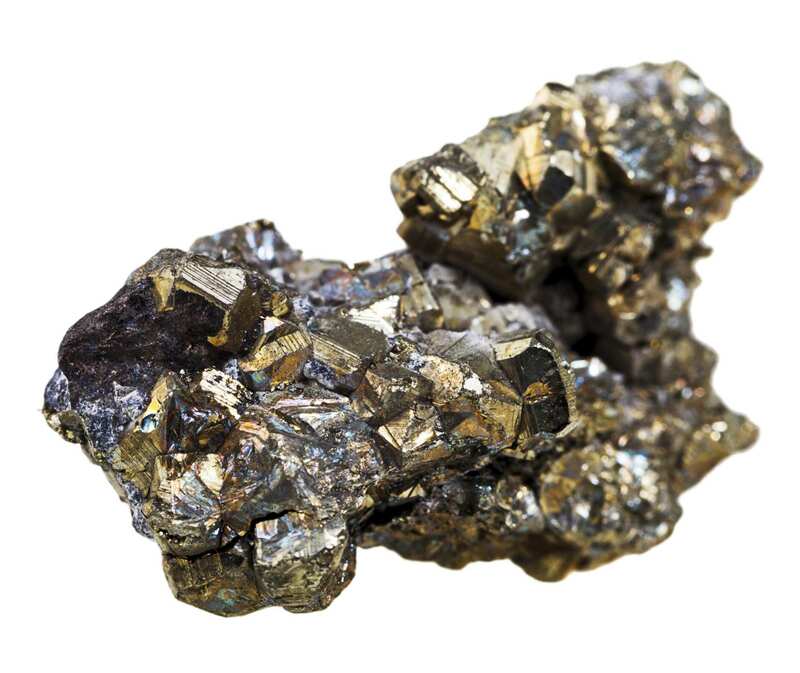 Pyrite is a widespread natural source of arsenic, which can leach into ground-water aquifers when geologic strata containing pyrite are exposed to the air and water, during coal mining for example. Acid mine drainage and groundwater contamination requires close monitoring to ensure that it has been neutralized before being returned to the earth. A question: If you have a shiny and tiny golden color spot in your sample, how would you identify it? Is it gold? Is it pyrite? Portable x-ray fluorescence (XRF) analyzers are an important tool in this effort. In 2-3 seconds, you can identify that grain using a portable XRF. Isn’t that amazing? In addition to being used for exploration and mining applications, XRF analyzers can be used to monitor elemental contaminants at mine sites and in waste streams. XRF analyzers are capable of quantifying a wide range of elements, including sulfur, lead, and arsenic. I recently discovered a very large mudslide which completely removed all river rock sands and gravel. What I found was very exciting. Exposed where there was once thousands of tons of earth was now rotten bedrock with a 60 foot long by about 4 feet wide bluish clay waterslide weaving through the bedrock. The bedrock contains alot of quartz. On the side walls that a day earlier were buried under ten feet of earth I see fine gravel streaks where thin areas of blue clay were worn away. There were little trails in the clay and they were filled with what I thought was fine gold. I began panning and this shiny brilliant color was heavy enough to be all that remained in the pan along with hundreds of garnets. So my question is this. The waters edge was stained with Rust.other elements found were rotten bedrock, blue clay, garnets, pyrite, copper flake, quartz and fine gravel which looks like it runs under the blue clay. Could I be close to finding gold and silver with all these historically gold bearing minerals found together in the same location. Can Portable XRF Handle Concentrated Ore Samples?